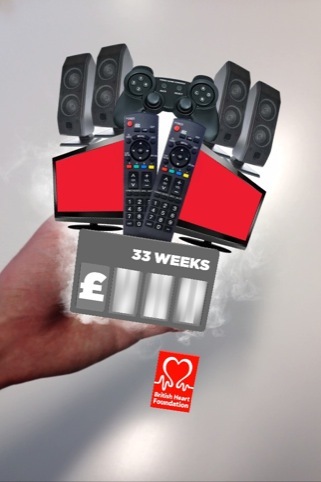 The British Heart Foundation has launched a campaign for No Smoking Day, on 13 March, that ‘hijacks’ cigarette packets, transforming them into virtual ‘swag’ showing smokers how else they could spend their money. According to Blippar, which has created the technology behind the app, the project is the first time ever that product packaging has been hijacked using augmented-reality for a charity campaign. The app uses Blippar technology to allow people to scan the packets’ Government warning signs with a smartphone, revealing a ‘cloud of digital smoke’, out of which appears items such as cinema tickets, gadgets and planes and luggage, reflecting holidays, encouraging them to ‘swap fags for swag’, says Blippar. 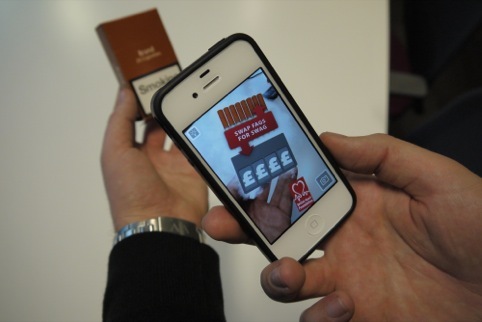 The app works using recognition technology that has been programmed to recognise the standardised on-pack warnings, such as ‘Smoking Kills’ or ‘Smoking seriously harms you and others around you.’ All the graphics were designed by Blippar’s in-house team. Once the ‘swag’ items have been displayed to the user, the 3D interactive content will direct the smoker to the WeQuit.co.uk website, which provides resources to help smokers give up. The app can be used on IOS or Android devices on smartphones and tablets.